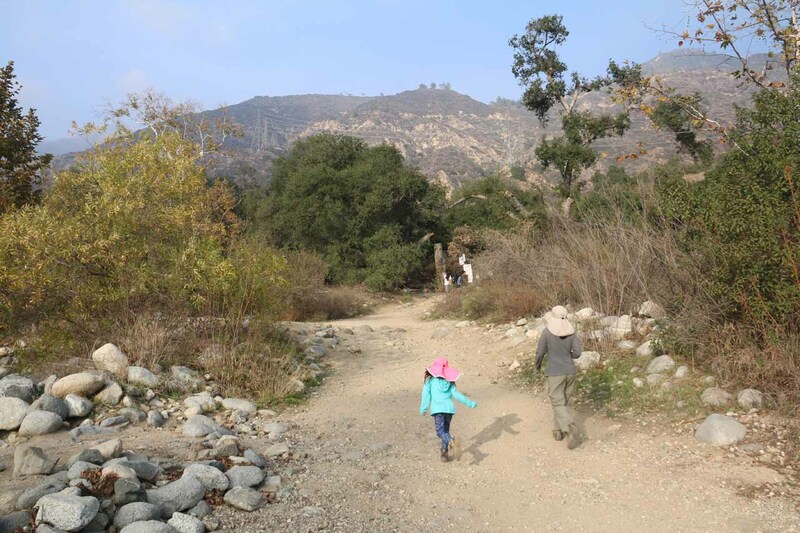 10-December 2016: Near the base of the Eaton Canyon Falls were some roses as well as another ledge where there was another bouquet of dried up flowers. I’m betting that these were to commemorate lost loved ones who must’ve died trying to reach the upper waterfall. So even though I didn’t know how to get up there, I definitely thought it was best that I didn’t know. 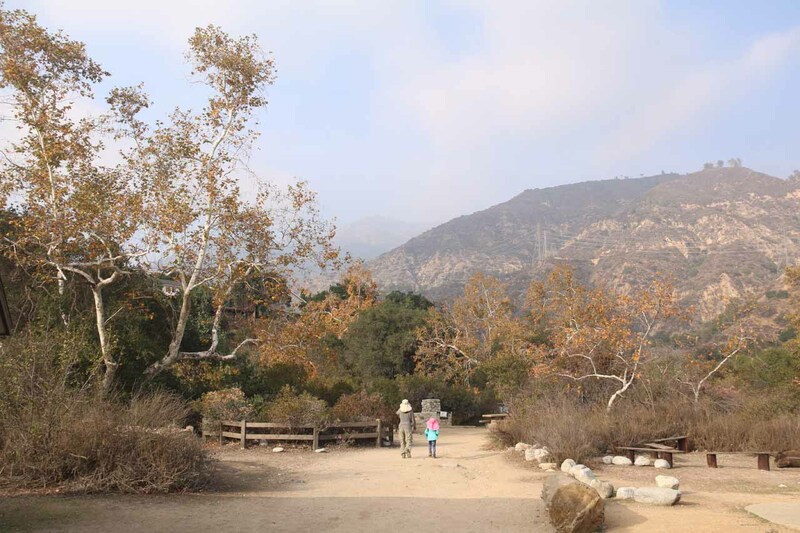 It was about 12:15pm when we left the house for Eaton Canyon Falls. Like with the last hike to Monrovia Canyon Falls last week, we intentionally got a late state to the day so Julie could get around to making a healthy breakfast and not have to rush to try to make a futile attempt at beating the morning rush to the waterfall hike. Of course, the flip side to doing things this way was that we’d have more limited daylight hours to try to fit in the hike before darkness, but we knew what we were getting ourselves into with this hike. 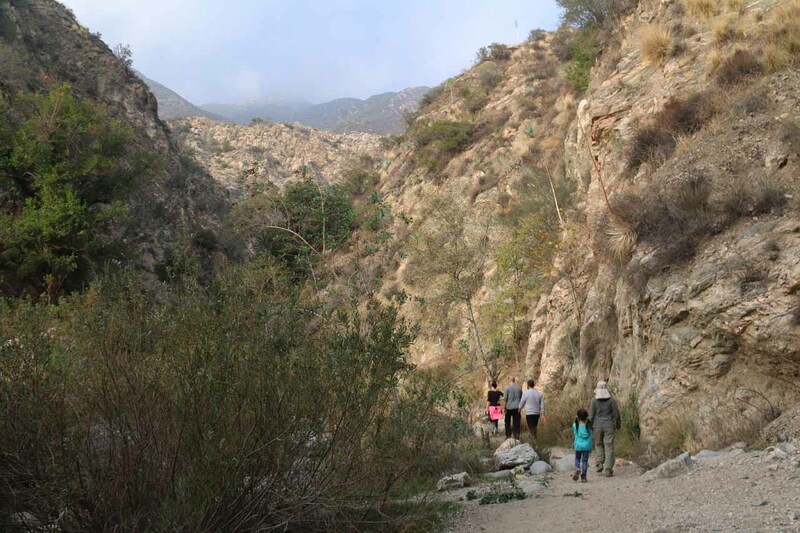 In fact, I wanted to see how Tahia would do since I knew that this particular hike was a bit of an upgrade in difficulty over the Monrovia Canyon Falls hike. 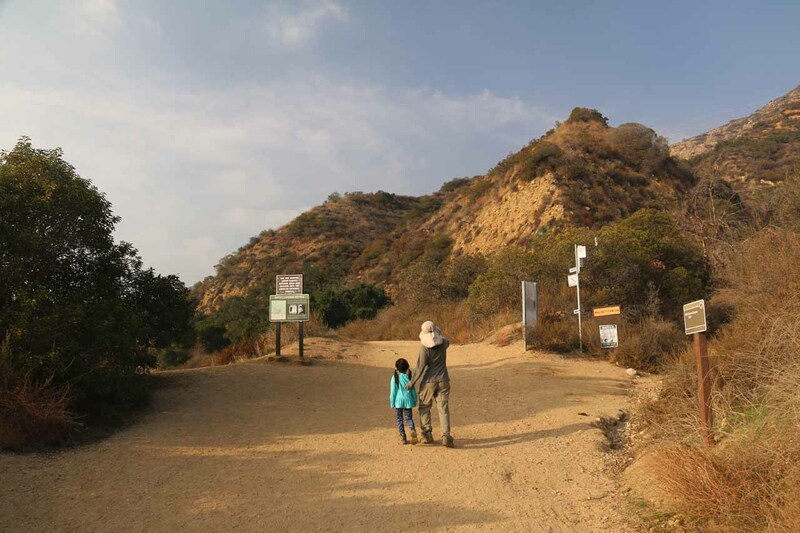 The last time we did this hike as a family was actually a couple of years ago. Back then, we were still carrying Tahia in a child carrier. But this time around, I wanted to see if she could do the hike on her own. So as we drove north on the familiar I-605, there happened to be a bit of traffic around the I-5 interchange and even beyond that towards the 60 and the 10. 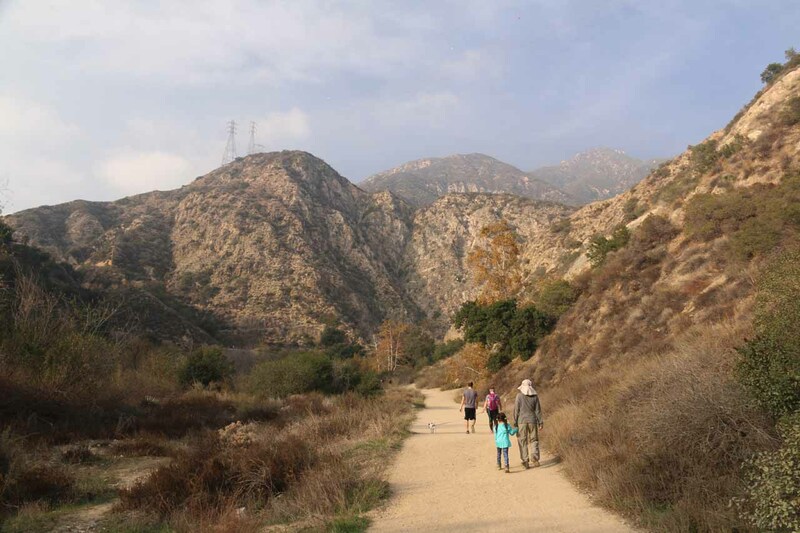 Even with the sluggish pace, we were seeing that as we got closer to the foothills, there was some light clouds shrouding the peaks of the San Gabriel Mountains, but we also knew these clouds wouldn’t have any bite in terms of dropping rain. 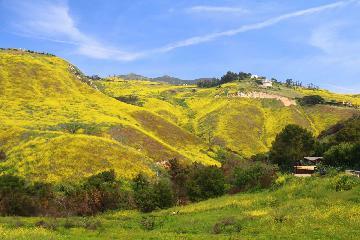 As we got onto the 210, Julie had us head towards Pasadena so we could eat lunch before going on the hike. This time around, instead of Tender Greens, she wanted us to try out Urban Plates. It was a competing place that served up organic and whole food fare, and after having eaten at Tender Greens for so many times in a row, we were in the mood for something different. So after some more sluggish driving along the I-210 west, we finally got off the familiar exit at Lake and then drove south towards the Urban Plates. They actually had free 90 minutes parking in a big lot behind the row of buildings that contained the Urban Plates among others so parking was not an issue and neither was validation. At about 1:15pm, we were in the Urban Plates in Pasadena, where we saw that they had steak with chimichurri sauce. Usually Julie and I would get different items on the menu so we could try out different things, but this time, we both got the same thing seeing that we wanted the Argentinean style steak. We also bought some delicious chocolate-chip cookies (which Tahia very much looked forward to) as well as a small pizza to pacify her though we still tried to make her eat her fruits and greens. But since she had an aversion to spicy foods, she couldn’t really have our brussel sprouts (which had peppers on it) as well as broccolini, which also had peppers. She couldn’t even eat our steak because the chimichurri sauce also had some hint of spiciness. So this meal wasn’t as nutritious as we wanted for our little girl, but regardless, we were back in the car at 2:05pm. Now that we were all sugared up from the indulgent cookies, it was now time to try to burn that off with the upcoming hike. 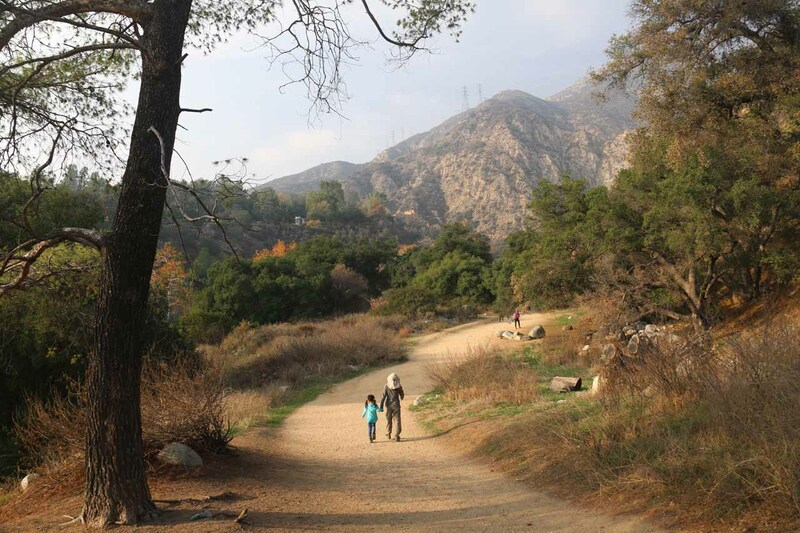 When we rocked up to the car park for the Eaton Canyon Falls, we saw that our late arrival as part of or even later than the “second wave” once again paid dividends in terms of being able to park real close to the trailhead. 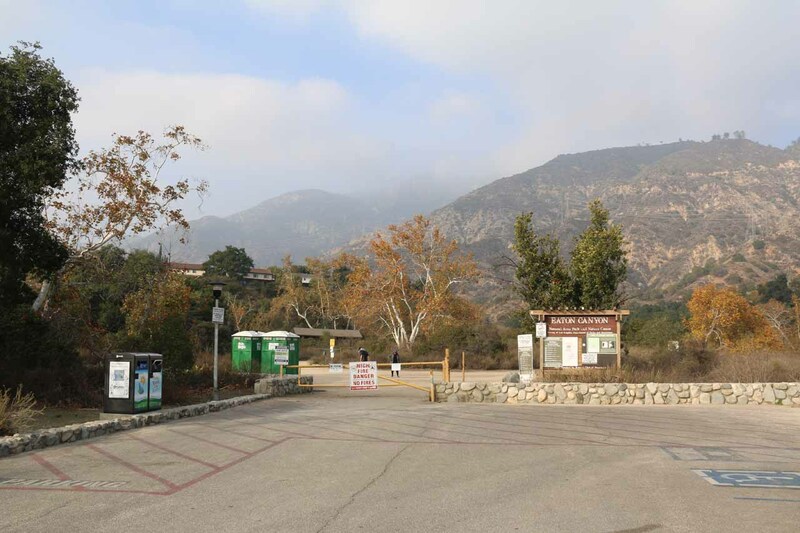 In fact, when we got out of the car at 2:20pm, we were pretty much a few paces from the nature center. However, we also saw signs that they’d close the gate at 5pm so that only left us about 2.5 hours of being away from the car before we’d risk getting locked in. So with the fading light of the day, we promptly got geared up and started the hike. The trail wasn’t as crowded as we were used to, but there were still dozens of people going in either direction (mostly leaving but there were still some headed to the falls). The first 1.5 miles of the hike was pretty flat as it went along the familiar wash. We wondered if people were still doing the shortcut from the homes across the wash, but from what we could tell at the time when we finally got to the bridge at the foot the canyon, we didn’t see anyone going down that way. Did they start to lock the gate up there? 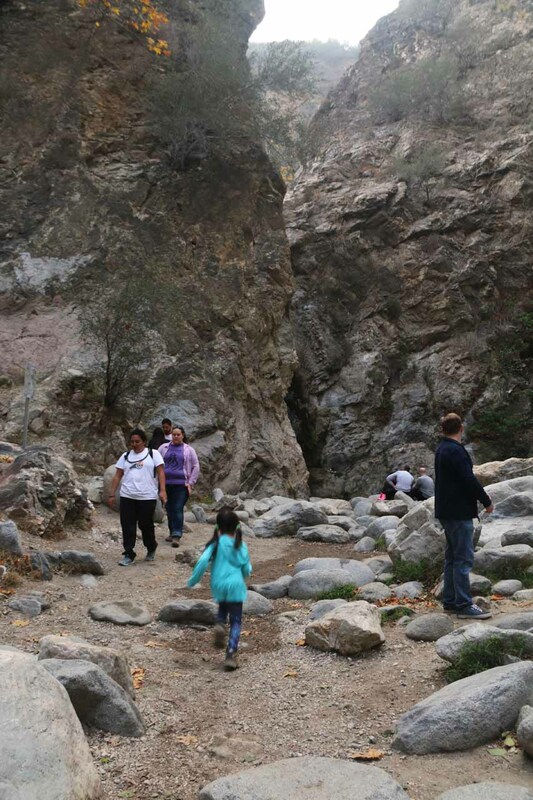 After seeing some map sign saying something about forest service lands closing all access to the Upper Eaton Canyon Falls, I was still curious as to how people would make it up there. 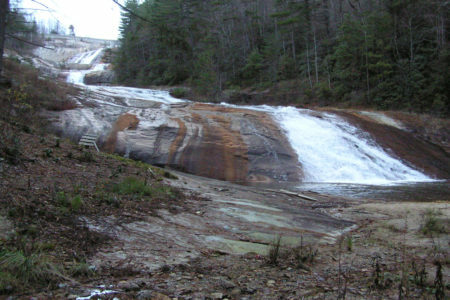 Perhaps it’s better that I don’t know seeing that this place was very prone to accidents mostly from people trying to do the dicey scramble to get up to that upper waterfall. Still, it was a nice and cool comfortable hike even with the increased distance over last month’s local hike. 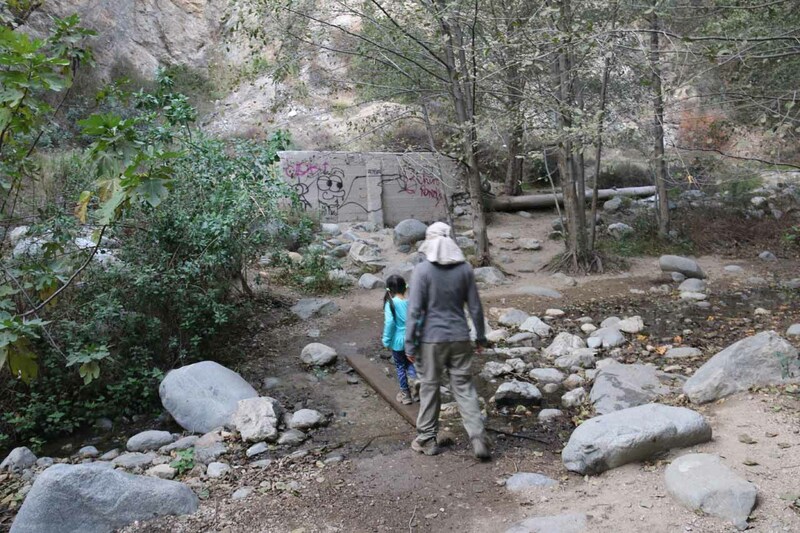 However, Tahia was noticing more graffiti along the walls and rocks along Eaton Canyon. It seemed quite a bit worse than the last time we were here, which was a shame. 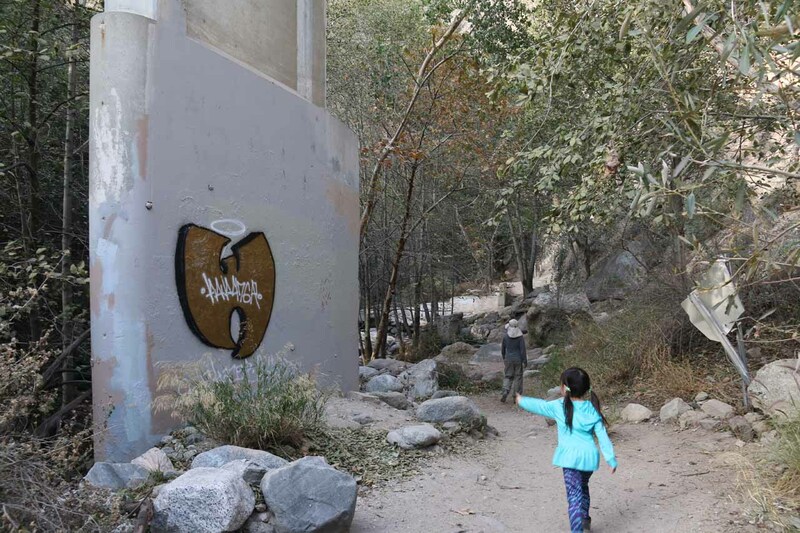 I wondered if they’d start charging visitors to hike this place (instead of it being free) to help pay for the clean-up, which I’m sure was a constant struggle given the urban blight and the tendency for gang activity resulting in the tagging. 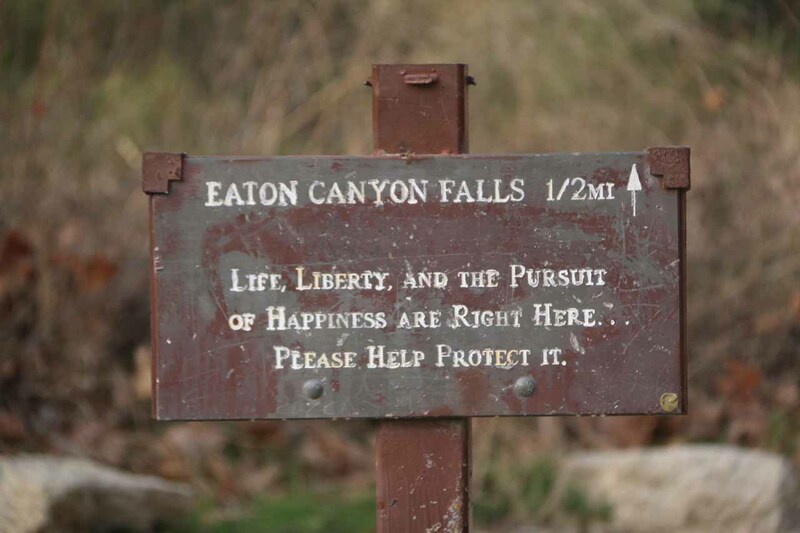 It sure was nice being able to hike through the canyon without needing to carry Tahia, but it also meant that her newfound freedom resulted in more opportunities for her to get injured as she tended to underestimate the hazards before her. This was especially the case when she’d insist on going over slippery boulders instead of going around them. Luckily for her, when she did take a spill, it wasn’t bad enough to injure her. 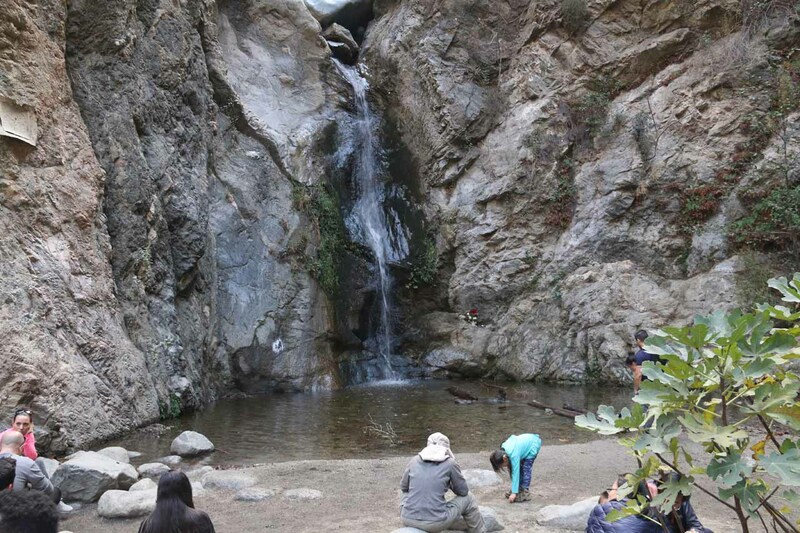 It wasn’t until about 3:25pm when we finally arrived at the familiar Eaton Canyon Falls. 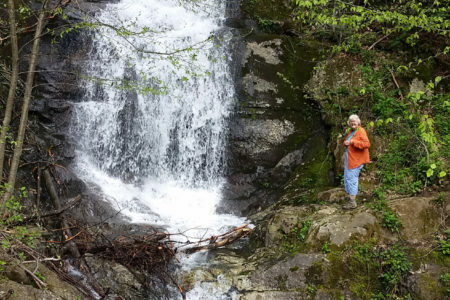 We didn’t expect there to be much water over the falls, but it definitely wasn’t insignificant considering how little rain we had been getting this rainy season so far. 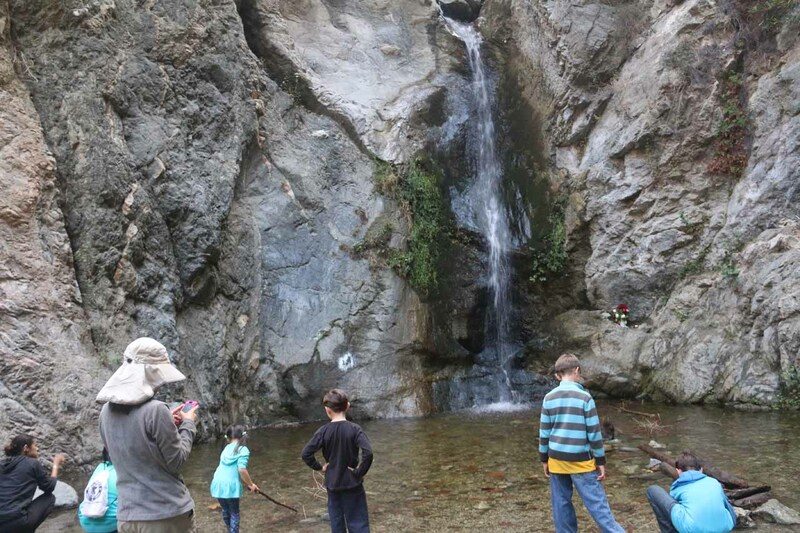 But that was why we picked this hike since we knew Eaton Canyon Falls was one of the few year-round waterfalls in the Southland. Seeing that we still had about 90 minutes before the gates closed, we chilled out here for the next 30 minutes or so to let Tahia play around the plunge pool as she was busy trying to watch leaves float and use a stick to guide those leaves. Other kids rocked up to the falls and were doing their mischief in much the same way Tahia was. 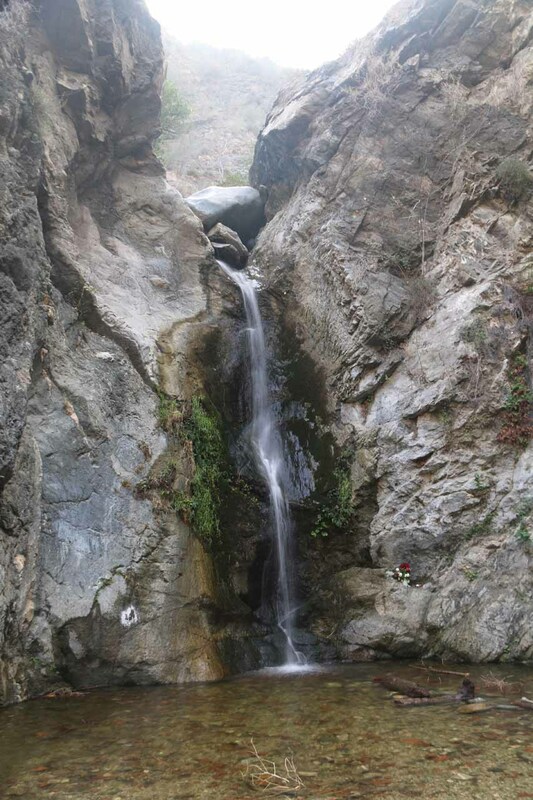 Near the base of the Eaton Canyon Falls were some roses as well as another ledge where there was another bouquet of dried up flowers. I’m betting that these were to commemorate lost loved ones who must’ve died trying to reach the upper waterfall. So even though I didn’t know how to get up there, I definitely thought it was best that I didn’t know. 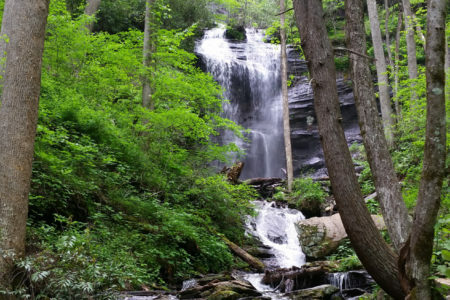 That said, a pair of African American guys were talking about the route to get to the upper waterfall and it involved scrambling high above on the very steep cliffs to the left of the lower waterfall. In looking up there, I couldn’t even see the trail so I wondered incredulously how people could be scrambling along those cliffs. Anyways, no one was doing that while we were here. And so as it was getting bit darker by the minute, we finally started to head back at around 3:50pm. My camera batteries were just about out so I couldn’t take as many photos as I would have liked, especially on the return hike. Still, we made haste as we walked back to the car park. I couldn’t believe that there were still a few parties of people heading to the falls while we were heading out. Wouldn’t they be locked in? 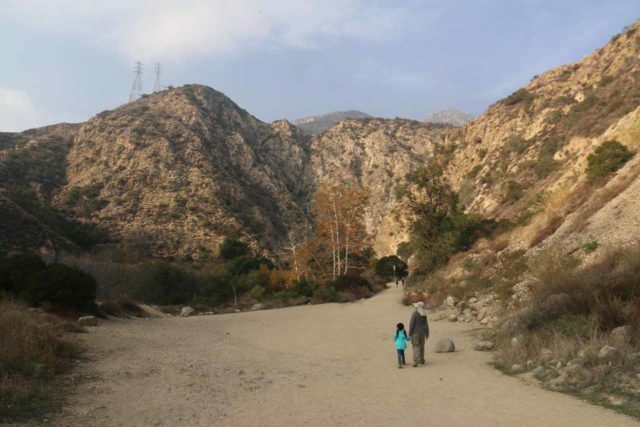 Well, as we left the mouth of Eaton Canyon, Julie noticed that there were some families walking across the bridge and up towards the homes across the wash. Clearly, that shortcut was valid, and she wondered why we didn’t give that route a try next time. Meanwhile, on the rest of the 1.5 mile hike back to the car park, Tahia was being silly as she was trying to hike and hide behind me, but she was doing a bad job of hiding as she was giggling uncontrollably. By the time we made it back to the car park at 4:40pm, there were still quite a few cars here. We wondered if the cars still left here after 5pm would be stuck here once the cops close the gates. Because as we were pulling out, we could see a pair of cop cars parked next to each other with their lights on waiting to close the gates. It made me wonder if there were strip spikes on a different exit allowing people to get out a different way while the main entrance gate would be closed. Anyways, Tahia was in the mood for some Din Tai Fung soup dumplings. And so we drove towards Arcadia for DTF. But when we rolled up to their old location, which was next to a bank, we saw that it was shut. Clearly, they moved locations to a new mall location, which Julie just noticed on her phone. When we looked at their original location on the other side towards the Asian plaza off Baldwin, we saw that it was quieter but still open. However, they didn’t serve xiao long baos there. No wonder why it was quiet there! I’m willing to bet that the surrounding businesses there would be severely impacted by the reduced traffic. And so we headed back towards the Santa Anita Mall, which was their new location. We eventually got there at 5:30pm, where we waited for our number to be called (it was about a 30-minute wait), and we finally got our helping of soup dumplings. We refrained from getting the truffle and pork dumplings, but we did try their chocolate mochi dessert xiao long baos. When dinner was done, we strolled around the mall some more (not exactly my favorite activity), where we picked up some Mrs Fields cookies as well as some visit to Daiso, where they didn’t have some magnetic clips. It was definitely holiday season in the mall as there were people in line waiting to take pictures with Santa as well as a lot of people out and about in the mall.